What do the following bands and musicians have in common: Porcupine Tree, Black Eyed Peas, Pat Travers, Todd Rundgren, and Adrian Belew? Well, besides being talented artists, they have all been seen playing a funky looking acoustic guitar that seems to have borrowed some visual cues from familiar musical door chimes. Fortunately, no tethered ball or mallet is necessary to evoke beautiful sounds from within a Babicz guitar. 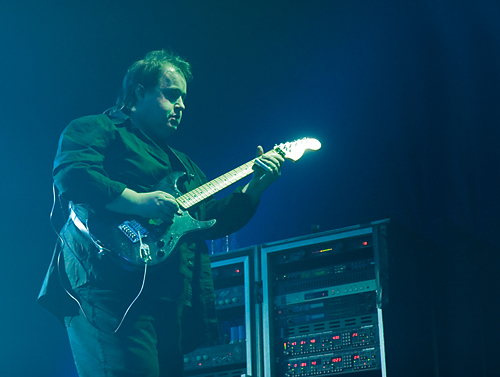 The unique design does, however, play an important role in defining the tonal sound and long-term physical condition of the guitar. The Babicz Identity DRW-06 acoustic guitar has all the right stuff thanks to a combination of great sound, superb playability, and some very innovative structural designs. Most noticeable is the fanning of the strings across the sounding board, which adds quite a distinct look to the guitar. Once we took an in-depth look at the engineering principles behind this design – it’s not just for cosmetics, and understood the physical and tonal effect of this design on the guitar, we found the design to be truly genius. OVERALL RATING = 3.6, which earns it a WIHO Award. Equally impressive, Babicz developed new technology that enables the player to make neck/string height (action) adjustments on the fly without any complexity or intonation changes/adjustments. This guitar is well worth your consideration and is the first acoustic guitar to receive our prestigious WIHO Award. The Babicz Identity DRW-06 is constructed of a high gloss-finished, solid rosewood back and sides, with a satin finished, solid spruce top outlined by black/white/black binding. The two-piece bound mahogany neck (also in satin finish) provides continuous adjustability through its two-way truss rod and Babicz’s patented neck height adjustment feature for desired string action preferences – an extremely cool feature we’ll talk more about in the Usability section of the review. Starting at the top of the guitar, the face of the headstock is constructed of a rosewood overlay fitted with black Grover tuners. The neck is a comfortable C shape, 1-11/16” at the nut spanning twenty frets, with a 25.5” scale length. This is where it gets really interesting. The Babicz Identity Series guitar is fitted with an adjustable rosewood torque-reducing split bridge system. What? Unlike conventional bridge systems that are glued to the top of the guitar, the Babicz bridge is anchored to the guitar via a fastening system that allows the bridge to be loosened and repositioned for intonation adjustments. With most bridge systems on acoustic guitars, the strings anchor into the bridge, focusing all the tension at the center of the soundboard, and here is where the Babicz split bridge design comes into play. Once the strings pass over the bridge, they are channeled through a string retainer (second part of the split-bridge) that pitches the strings downward from the back of the bridge, providing pressure from the strings down and over the bridge to the body of the guitar. Note that at this point, there’s still no anchor to the most flexible part of the soundboard (top) of the guitar, thereby eliminating any pull or tension that would result in decreased vibration of the guitar top. From this point, the strings are fanned out to the edge of the guitar top, where they are anchored via posts through the soundboard connected to anchor plates on the inside of the guitar. With this design, Babicz is able to achieve a more lateral tension pattern spread over a wider area of the guitar, resulting in full-bodied sound quality. Another attributing factor to this guitar’s great sound is that with the string tension being disbursed across the soundboard instead of anchored in the bridge, less structural bracing is needed inside the instrument, allowing the soundboard to vibrate more freely. Cosmetically, this guitar displays excellent craftsmanship. The glossy back and sides reflect a very deep, rich rosewood tone and compliment the satin-finished mahogany neck and spruce top. We did, however, detect some very light and barely noticeable cosmetic flaws on the neck. At a few frets, the finish was chipped – possibly during the fretwire installation. The Babicz guitar came equipped with a nice hard shell case providing sufficient protection for the guitar. 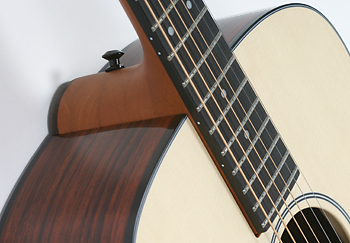 Though not equipped in the model reviewed, this guitar can also be ordered in an acoustic-electric model. The Babicz Identity was very enjoyable to play. The neck is true from top to bottom, providing clear fretted notes and perfect intonation throughout. On this particular model, notes in the upper register were difficult to reach due to the dreadnought body style. 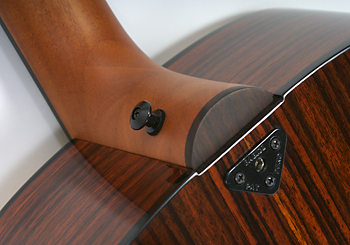 If your playing requires upper register accessibility, you will want to opt for one of the cutaway models offered. The smooth, unfinished neck was also a factor in ease of playability. From a mechanical standpoint, we really enjoyed the neck adjustment feature developed by Babicz Guitars. 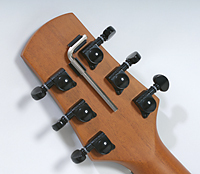 Using the supplied allen-wrench, clipped to and easily accessible at the back of the headstock, we were able to easily make adjustments to the string height depending on our playing techniques and string action preferences. The Babicz neck adjustment feature enabled us to raise the entire neck up or down in relation to the body of the guitar in order to achieve our preferred string height. As a result of this feature, the neck is not anchored or glued to the soundboard of the guitar, which at first glance seems to buck conventional wisdom regarding acoustic guitar design. But as our testing revealed, that may just be one of those old ways of thinking that is due for revision. 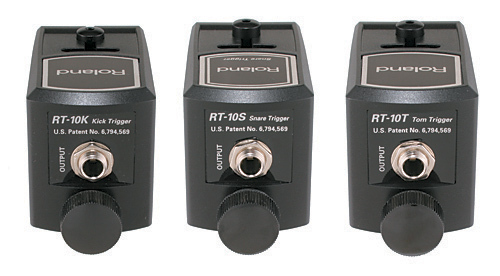 With Babicz, their design philosophy seems clear: do as little as possible to minimize the soundboard’s ability to resonate, an approach that works great in the guitar presented to us for testing. Because the neck movement is up and down, there is no need to worry about affecting the intonation of the guitar. Conventional neck adjustments cause change to the actual scale length of the string, which usually requires intonation adjustments at the bridge. Never fear, though. The intonation on the Babicz guitar is adjustable as well. By loosening the anchor fasteners, the bridge can easily be moved forward or backward via the slotted soundboard to dial in accurate intonation. We had to check this cool feature out for ourselves and found that by loosening the bridge fasteners, repositioning of the bridge was a breeze. The movement was very smooth and easy to adjust, much like that of the floating bridge system on a jazz guitar, but better because you can clamp it down and not worry about it being bumped out of position. Between the player-adjustable neck action and intonation features, we have never before experienced this kind of flexible setup in an acoustic guitar. 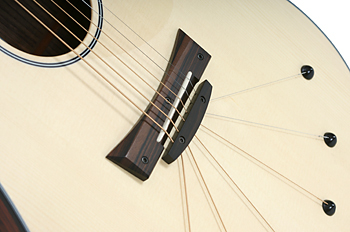 Upon first glance at the guitar, we were curious if longer string lengths were required in order to accommodate the fanning of the strings to the outer edge of the soundboard. Not at all – the Babicz guitar uses standard strings, enabling you to use your favorite brand. We found the Identity DRW-06 to be very bright and full bodied in sound. No matter which position we played, the guitar provided consistent tonal quality including a good balance of low, mid, and high characteristics throughout the entire tonal spectrum. As a result of the “ICZ” Lateral Compression Soundboard, this acoustic guitar generates good volume levels combined with excellent tone. We played a variety of different styles on this guitar ranging from Country to Jazz and Pop to Rock. The Babicz guitar responded well to all playing styles and techniques, providing a bright piano-like tone all its own. Though Babicz forgot to include the product documentation with our review guitar, it typically ships with instructions for adjusting the string action and intonation. Fortunately, we found the Babicz Guitars website to be very informative. It provided ample information and support for us to perform all the tasks described in the Usability section. A three-year warranty is provided for the Babicz Identity guitar. The Babicz Identity ID-DRW-06 (MSRP $1,095) can be purchased for just under $900, an excellent value. 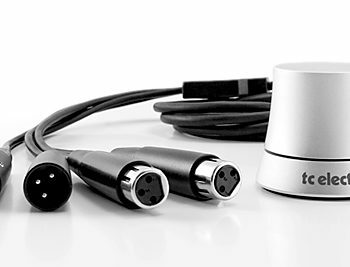 For an additional $399.00, you can order the same guitar with an L.R Baggs iMix onboard pickup system. Do you like this guitar? How would you like a chance to win it? MusicPlayers.com and Babicz Guitars have arranged to give away this outstanding acoustic guitar to one of our readers at the end of April. Click here for the giveaway details.